This is a website where I intend to teach how to write a finite element code from scratch. Separately, I also plan to put up tutorials of how to use a finite element software (CalculiX and/or Abaqus) to solve engineering problems. As the name suggests, this website is about the ‘Finite Element Method’. For those of you who are unfamiliar with this analysis technique, the ‘Finite Element Method’ (abbreviated as FEM) is an approximate mathematical technique wherein a set of algebraic equations is established and solved numerically. 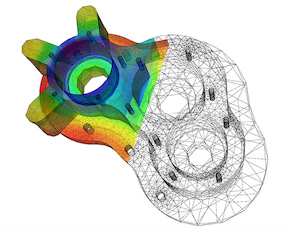 Finite element procedures are at present widely employed in various engineering disciplines and there is a preponderance of computer softwares that the engineer can use. However, seldom is the case that the end-user has a complete understanding of both a)the basics of this analysis technique and b) It’s implementation. The courses taught in engineering classes can only afford to touch the basics of FEM. On one hand, the commercially available computer computer codes act as black boxes and on the other hand the open source softwares, in my opinion are complicated to go through for a novice/intermediate student. Also, I believe that textbooks become very intensive to read for someone who works full time during the week. I hope that this website would help those who want to learn not only the basics of the method but the actual workings of a full fledged 3D FEM analysis software.